We’re looking for people who sell Movies (DVD, Blu-ray, VHS tape, 16mm Film), Movie Posters, Toys, Autographs, Movie Collectables, Records and Music Related Stuff (Cleveland is the Rock ’N Roll Hall of Fame City after all), Nostalgia, and anything “baby boomer” related. 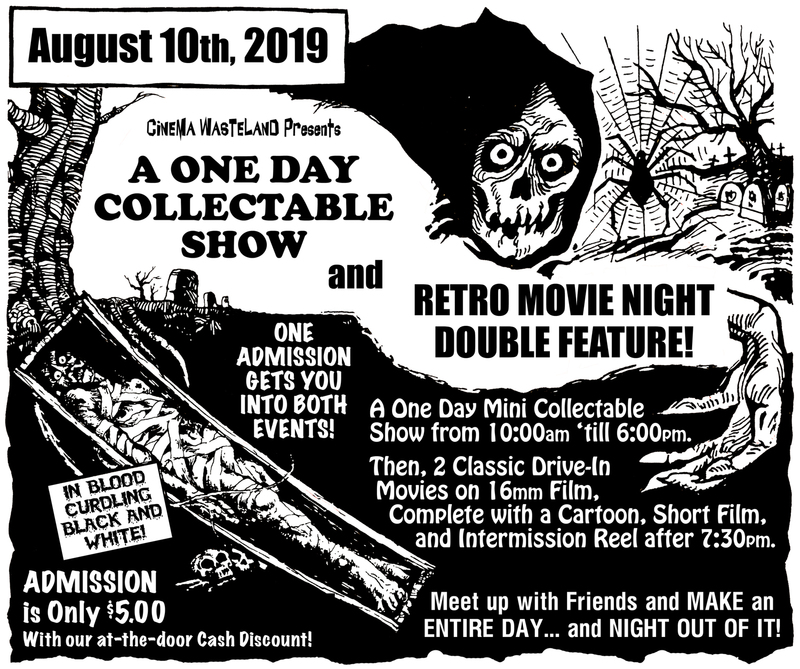 Tables for our One Day Collectable Show are nice and affordable. A 6 foot table (with approximately 4 feet of back space) is only $75. * Right now, we are asking people to take Only 2 tables max so we can offer tables to as many people as possible. There are only approximately 35 tables available so we’d like to squeeze as much of a selection as we can into the space. * If you need wall space, let us know and we will do our best to accommodate you. * If you do not need wall space and can set up and tear down quickly, you are our hero. Please let us know so we can stick you where we need to set up chairs for the film show. * Electricity is free, but you will need to have an extension cord (and duck tape to tape it down) with you to get to a plug. * Please Do Not set up a display that will take longer than an hour to tear down. The Collectable Show ends at 6:00pm and all vendors should be out of the room by 7:30pm so we can begin our evening Film Screenings. * All vendors are welcome to stick around and watch the Film Screenings. Please email us at zombies@cinemawasteland.com to see if we have space available. If you have been told we have space please Click Here to pay for tables.